After creating a page about Levaquin and the Side Effects of Levaquin I was contacted by and had a great conversation with Mr. David T. Fuller, the Director of the Fluoroquinolone Toxicity Research Foundation. Below you will find the conversation and a wealth of information and experience as provided by David. 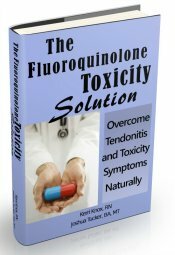 Note: Also since this conversation, I've now contributed authorship to a book called The Fluoroquinolone Toxicity Solution, and I highly recommend that you get the book and start on the protocol if you believe that you are suffering from the side effects of Levaquin or any of the other Fluoroquinolone antibiotics. The mechanisms of action concerning tendon rupture and the Quinolone Antibiotics is well documented and has been for decades now. I appreciate you getting in contact with me, and thanks for the website reference. "Although the exact mechanism of injury in fluoroquinolone-associated tendinopathy is unknown, it is widely speculated that fluoroquinolones are directly toxic to tendon fibers possibly associated with further decreased blood supply that particularly targets tendons that generally have a limited blood supply to begin with." And a lot of '...it -appears- that cytotoxicity is the cause' of side effects of Levaquin. Do you know of a reference that has findings of exactly how the damage is caused that you can direct me to? As far as healing the damage, I am very interested in this topic. Not just reducing the side effects of Levaquin, but actually getting to the ongoing CAUSE and reversing it. It makes sense to me that, for the most part, any damage can be healed. The body is always replacing itself. If the side effects of Levaquin toxicity is 'permanent', then it makes sense that there is possibly a way to pull those factors from the tendon. Or conversely, add them to the connective tissue. And since some people do heal, there must be some ways to support the body to heal better and faster. The general consensus is that the fluoroquinolones inhibit the proliferation of tendon cells and chondrocytes at increasing concentration. The inhibition of proliferation of tendon cells and chondrocytes after exposure to the fluoroquinolones are associated with induction of apoptosis, as evidenced by the typical nuclear apoptotic condensed nuclei found using Hoechst 33258 staining. It has been shown in any number of studies that tendon cells and chondrocytes exhibited apoptotic features and fragmentation of DNA.. The bottom line being that the fluoroquinolones inhibit cell proliferation, induces apoptosis and induces DNA fragmentation. Cytoskeletal and signalling proteins, such as activated shc or erk 1/2, are significantly reduced by this class. Apoptotic changes have been confirmed by electron microscopy: fluoroquinolones cause typical alterations like condensed material in the nucleus, swollen cell organelles, apoptotic bodies and bleb formation at the cell membrane. Any number of studies have provided evidence that besides changes in receptor and signaling proteins, apoptosis has to be considered as a final event in the pathogenesis of fluoroquinolone-induced tendonopathies. Basically cells dying quicker than they can be replaced eventually leading to ruptures. There are a few older histologic studies such as Jorgensen et al who have reported necrosis with neovascularization, interstitial edema, and degenerative lesions with fissures but without inflammatory cell infiltrate or angiitis. They proposed that tendon rupture might be due to vascular phenomenon leading to ischemia, which is where the statement you refer to ordinates. Most tendon ruptures are at a site of deficient blood supply, lending to the possibility of an ischemic process. Several clinicians have described Achilles' tendon rupture 2 to 3 cm above the calcaneal insertion, which is relatively avascular. LeHuec et al found a few macrophages and giant cells peripheral to the injured tendon. However usually giant cells indicate a reaction to a foreign body. A 1997 study by Movin et al revealed irregular collagen fiber arrangement, hypercellularity, and increased interfibrillar glycosaminoglycans. These findings are present in tendon overuse injuries in athletes as well. Side effects of Levaquin including tendon injury has been reported to occur as early as 2 hours after receiving the first dose of a fluoroquinolone (ciprofloxacin) and as late as 18 months after treatment had been terminated. There have been unconfirmed cases of such ruptures taking place up to five years after therapy as well. Pathological changes may be minimal or nonexistent in tendinitis with edema; or they may be degenerative focal disease, with granulomatous changes and capillary cell proliferation; or they may display infiltration of fibrocytes, as in chronic tendinitis. Hyaline and mucoid degeneration, chondroid metaplasia of the tenocytes, and alterations in mucopolysaccharide and collagen fibers have also been described. But it has been my experience after dealing with such patients for over a decade now that the mechanism is to be considered to be related to direct toxicity to the collagen because of the rapid onset of tendon injury as well as the persistence of such injury. In any number of cases the tendonitis progresses to permanent disability that defies all known treatments. In fact a number of treatments have been reported to make things much worse. Particularly physical therapy and steroids. To take this a step further one has to consider the possibility of permanent DNA damage. The blueprint by which such cells are made. True that the body is constantly in a state of cells dying and being replaced. But I am of the opinion that the replacement cells in our case are now defective. DNA damage has been demonstrated with this class. The recommendation regarding magnesium is based upon the chelating properties of magnesium as it binds to the fluoroquinolones during therapy. But once therapy has been completed the fluoroquinolones have been excreted, normally within 24-48 hours after the last dose. So taking magnesium after the fact would not have such chelation properties as there are no fluoroquinolone metabolites to attach to. But magnesium has shown some benefit in regards to treating nerve pain in a few patients. The largest misconception regarding these side effects of Levaquin issues is that the damage ceases when therapy is discontinued. Based upon the assumption that this is an allergic reaction that would dissipate once the drug is stopped. But this is not the case. Here we are dealing with the damage done WHILE the drug was in the patients system as well as the profound changes on a cellular level (as well as DNA) that has a domino effect down the road. Such damage continues long after therapy had been discontinued. Years in fact. No doubt that there are people who eventually recover from this. But on the flip side there are people who never do who end up disabled for life. And believe me there has not been one supplement (or combination of many) that has not been tried over the past decade with little to no success. Time seems to be the only answer. Some people are lucky and some are not. Some people respond to traditional treatments, other have found them to be a total disaster. One must first understand the exact mechanism of action to be addressed. In our case they are multi faceted as noted above. A lot of the alleged benefits of supplementation are based upon the proper response of the host to the chemicals being introduced. With the quinolone damage this response has been turned inside out. The chemical factory of our bodies has been trashed. Not only with the tendon and muscle damage but also on an endocrine level. Not one organ in the body is left unscathed. The patient is also experiencing liver damage, kidney damage, muscle and cartilage damage, nerve damage, digestive disorders, and on and on it goes. Where as with a sports injury you are dealing with either muscles or tendons. That’s it. Here we are dealing with a train wreck and the damage in one area affects the recovery in another. A Rubics cube so to speak. In time I hope that some reliable treatment protocol is developed to combat the side effects of Levaquin and allow actual healing. Having suffered from body wide chronic tendonitis for over a decade myself this would indeed be a blessed relief. And yes, I have tried everything under the sun to treat this without any measurable success, both with traditional medicine as well as alternative treatments. And I have no clue as to when this will rear its ugly head and put me flat on my back. Currently I am dealing with an inflamed Achilles tendon and a blown knee. Compliments of three games of bowling two weeks ago. And this is ten years after the last dose of Levaquin. But I am a bit of an exception as I was treated with floxin,cipro and finally levaquin over a two-month period for a kidney stone. Normally you find patients only being exposed to one drug for a week or two. Not three different ones over a two month period, two of which (floxin and levaquin) are the MOST toxic to tendon and muscle tissue. But the tendon damage was immediate and NOT recognized by the urologist as even being associated with these drugs. I am now blinded (permanent double vision) and crippled (chronic tendonitis) for over a decade now. Helluva a price to pay considering I did not even have a bacterial infection to begin with. d something of value there to aid in your research and treatment plans. I've been chewing on your response for the last week, sorry not to get back to you. Thank you so much. For your willingness to take the time to share all that, and to do it in such an educational and friendly way. And even with your trials, I appreciate your willing to live life to the fullest. That is the measure of a man. I'm not going to comment point by point, but thank you. The dna damage was what I was missing. It makes sense that if new cells come out 'bad' the body can't heal correctly. Certainly makes it more of a rubic's cube. I do like the train wreck analogy. I'm curious about a couple things. 1. I'm curious what you have tried around protein intake. I'm curious what would happen, if anything, if you did the bone broth recipe daily for a couple months. Just curious. 2. What have you come across regarding Vitamin D on this topic? 3. I'm curious, can I put our conversation, including your excellent SUMMARY and expert opinion (not plagarism:) on a page on my site? Even though it has big words, I find it easy to follow, and it feels like common sense when you say it. I would like to add in a couple of prominent links to your site too, and point people to you as the expert. My diet has always been high in protein, as I am a meat and potato eater and an ex recreational weight lifter. There are those who have tried things like whey protein, etc., but it really did not make any real difference for them. Vitamin D deficiencies are quite common after being exposed to these drugs. Personally that has not been an issue for me as I have worked outside construction my whole life and my levels have always been on the high side. But for those who are not exposed to the sun often enough this has proven to be an issue. 1.The effects of enrofloxacin on canine tendon cells and chondrocytes proliferation in vitro. Lim S, Hossain MA, Park J, Choi SH, Kim G. Laboratory of Veterinary Surgery, College of Veterinary Medicine, Chungbuk National University, Cheongju 361-763, South Korea. So as long it is made known that I am quoting the words of others in certain instances I don't see a problem with you posting this summary on your site. Links back to the research site would be appreciated and prove to be helpful to those who visit your site. But as I had stated previously I am expressing my opinions based upon my research. I am not trying to correct you so much as making you aware of the body of research that has already been done in regards to these issues. Hopefully when you review all of this you will find that your opinions may very well change as well. My goal is to provide the known facts so that those who are a helluva lot smarter than me can make some sense of all this. I am considered an expert in regards to the damage these drugs can cause, but I am certainly not an expert as to WHY they cause it. The best I can do is form an educated opinion in that regards. The main obstacle we face is the fact that so much of this "research" is nothing more than damage control by the drug companies. Just about all of the articles written about these drugs have been written by "spin doctors", those being paid by the drug companies to minimize and trivialize these reactions. Doctors such as Peter Ball, Glen Tillotson, Lionel Mandell, Bertino, Haverstock, etc who are all paid whores who have prostituted themselves as drug company consultants. Their main goal being to provide as much false and misleading information as possible. You find very little research that has not been directly influenced by the manufacturers. DNA damage is the only logical conclusion I can reach in regards to how these drugs can continue to cause serious problems for decades after they have been consumed. Revisiting this side effects of Levaquin page after a year or so away, here are some further thoughts/facts that may help shed light on how Levaquin works. Levaquin does attack connective tissue DNA, this is true. But as always, there's more to the story. 1. Levaquin massively depletes the body of Magnesium. This partly explains why some people get side effects of Levaquin and others don't. It also explains why some people get mild side effects of Levaquin and some people's bodies are devastated. If a person is -already- Magnesium insufficient or deficient, then they don't just end up short on magnesium, but they are in a critical deficit where the body literally can't operate. Either operate effectively, or operate at all. Side effects of Levaquin are muscle pain, ache, cramping, spasm, tightness, stiffness, headaches, as well as anxiety, nervousness, claustrophobia, ringing in the ears and loss of balance. But all those side effects of Levaquin are symptoms of magnesium deficiency. 2. Another of the physical side effects of Levaquin that you feel the effects of only indirectly, is that Levaquin attacks and kills mitochondria. Mitochondria are the energy powerplants in your cells. If they die (as DNA is attacked, for example) they create LOTS of toxins and waste product as they die off. This not only explains the side effects of Levaquin where your tendon literally falls apart, but also explains muscle pain, ache, low energy, and the body's downward spiral of working less and less well. 3. As David said earlier, side effects of Levaquin are the ongoing and end result of a train wreck. One result of that train wreck, is that the body is stewing in waste product, stress chemicals, extra cortisol, toxin from cells dying off. Add to that being undernourished, adrenal fatigue, cortisol imbalance, poor sleep, and all the physcial effects of of long term pain. But add to that, the body's natural detoxification paths can be blocked. So all that toxic sludge is stuck in the body, constantly poisoning the body, and being just one more major factor preventing the body from healing. There's A LOT going on in the Levaquin Tendonitis dynamic. No single drug will ever 'fix' it, no single factor will eradicate the side effects of Levaquin and other fluoroquinolones. One has to cover all the necessary bases for a complete treatment. If you haven't already, get started with the free 7 Day E-Course, sign up below. Return to the top of this Side Effects of Levaquin Conversation page. Go to the original Levaquin page that started it all. Go to the main Tendontis page.